Pearls are one of the most coveted jewels and the favorite gem worn by brides at their weddings.Their luminescence symbolizes purity and eternal bliss. 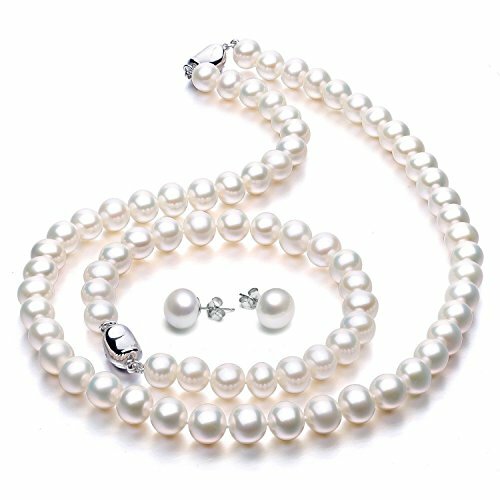 Pearls have been woven into legend and lore throughout history. Ancient Chinese people thought pearls were taken from the brains of dragons, the Greeks believed pearls were hardened tears of Aphrodite, the goddess of love. Cleopatra used a pearl earring to capture the love of Marc Antony, and lure him away from the Roman Empire. She told him she could consume the wealth of a nation in one meal, and then crushed her earring and drank it mixed with wine. Other legends tell of oysters swallowing dewdrops as the moon led them deep into the ocean. Natural pearls are very rare, accounting for only about 1% of pearl jewelry. They are found in the Japan, South Pacific Islands, and the Persian Gulf. To find a quality natural pearl many oysters must be opened and tossed away. Thankfully today, most pearl are cultured, meaning they are harvested on oyster farms. In the early 1900s Japanese researchers developed a method of creating a perfectly round pearl. One of the researches, Kokichi Mikimoto, found that by inserting a small bead into an Akoya oyster, pearls could be grown in large numbers and standard sizes. That made them affordable for everyone. Mikimoto’s process was patented in 1916 and the cultured pearl farming industry began. Practically all pearls made into jewelry today come from farms. Mikimoto’s techniques have been enhanced and refined so that modern pearls can be grown to a precise standard. These days pearl farmers breed oysters from high quality stock. They start the process with high quality eggs and sperm. Once the young oysters are mature enough, a tiny mother of pearl bead is implanted inside. The oysters are left to grow in sea beds for 2 to 5 years during which time many layers of nacre, or pearl tissue, forms around the bead. Farmers use modern technology to track the size and shape of the developing pearls. Once the gems are ready the oyster shells are opened and the pearl is harvested. The pearls are collected, cleaned and polished. Then they are sorted by size and quality. Only about half of the pearls are good enough to be made into jewelry. Those are sold at markets around the world. And just about 10% will be high quality pearls that will be made into elite jewelry designs. The rest are used in more affordable jewelry for ordinary people like me. The half that doesn’t make it to market are sometimes sold at a large discount, then treated or coated to create luster, and used for inexpensive jewelry pieces or crafts. Some of the deformed or damaged pearls may have the nacre removed so the remaining bead can be used in another crop. There are several types of cultured pearls on the market. Some examples are Tahitian pearls, from the South Seas, which are either black, pink, gray, golden, or different shades of white. Mabe pearls, also called blister pearls, are planted on the inside of the oyster shell, and grow to a dome shape. These are often attached to the flat surface against the metal of a ring or earring. And Biwa, or freshwater pearls, grown in Japan, each have a unique and unusual shape. 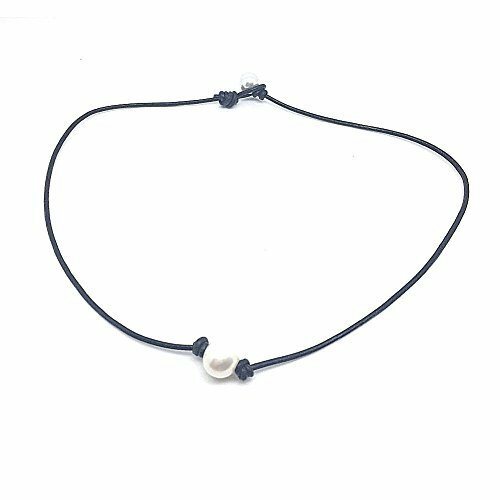 The most popular type of pearl jewelry is the Tahitian pearl necklace. 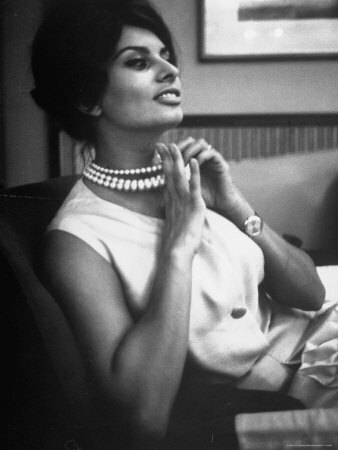 Nowadays women wear pearls to both everyday and special events. 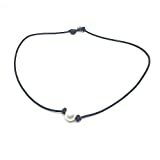 Because they are popular for any occasion you will find pearl necklaces in choker, princess, matinee, and opera length. Pearl strands are available in graduated or uniform strand sizes. 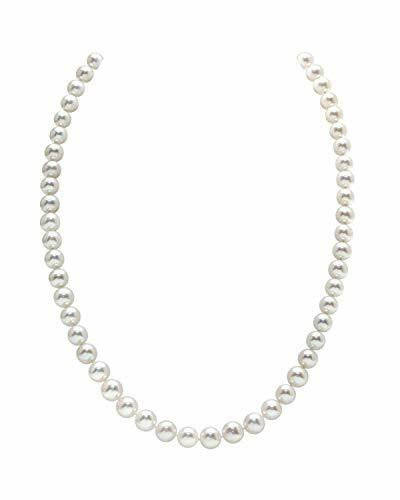 Graduated pearl strands have smaller beads near the clasp and larger pearls in the center. 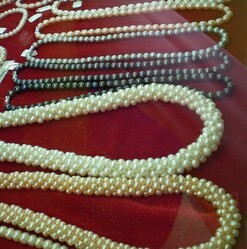 Uniform strands are made with similar sized pearls and are more expense because they include more large pearls. When choosing a necklace look for hand knotted strands. They will have 2 silk strings with a neatly tied overhand knot between each gem. Hand knotting prevents the loss of the pearls should the strand break. Sometimes lower quality pearls are treated in order to make them nice enough to sell. These methods may use silver nitrate to darken them, or dyes to color them. Pink pearls are usually dyed. Another treatment is irradiation with gamma rays which gives the gem a bluish tint. And some are coated with a pearlescent substance to give them a luminous sheen. Coating is not a desirable treatment because it will peel away over time. If you look closely at pearls when making a purchase you should see slight irregularities. Strands that are all the exact same color have usually been treated with nitrate or dyed. You can also look inside the drilled hole with a loupe and inspect for a darkened nucleus or dye residue. 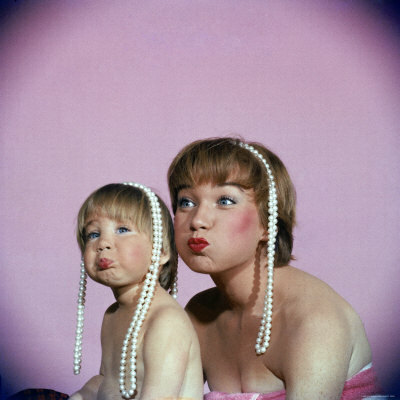 Coated pearls may be hard to detect. If you look at the surface with a jeweler’s loupe and see cracks or scales, or if they are very glossy, they are probably coated or imitation gems. It’s important to buy from reputable dealers and obtain a guarantee. Caring for your pearl jewelry will ensure it lasts a lifetime. Remember pearls are resilient and made to be worn, but they are not rocks. They are a natural organic substance so they deserve special care. One of the easiest ways to keep pearls luminous is to wear them often. Natural oils from your body will polish them. Always remove pearl jewelry when cleaning or applying cosmetics. The chemicals in cleaning supplies will damage the luster. Make sure you put on your makeup before you put on your pearl jewelry and remove it before bathing or removing cosmetics with a solution. Cleaning is best done with a soft cloth after wearing your pearls. Always clean any spills or sprays off immediately and never use jewelry cleaners. Storing your pearl jewelry in a linen cloth away from other jewelry is recommended. This keeps it from being scratched. And storing in a humid area keeps pearls from drying out. When the silk strings of a necklace or bracelet become worn or dried, have the piece restrung and at the same time replace any pearls that are damaged. My collection of vintage sterling advertising matchbook charms is growing more colorful. I'm always on the lookout for more. Monet Charms – To Collect Or Not? Do You Have A Favorite Piece Of Pearl Jewelry? Or just wear them at home, while you are typing, wearing your pyjamas. Is is really shameful to admit that I've done that before? I love them too Telesto. I have one strand but rarely wear them now that I'm working at home. Maybe I need to get out more. I love pearls! None of mine are the most expensive but I think they look really classy and give a glow to the face. Thank you. If you were born in February you may feel like royalty. Rightly so because your birthstone is the amethyst, favorite gemstone of Royalty and Clergy since ancient times. Dazzling sparkling festive Christmas tree pins are fun to collect and best of all you get to wear your pieces. Some collectors wear their pins year 'round. Read on to see why.